The Ayatollah Khomeini was blamed for many things in 1970s Iran. But never for stopping the son of an Iranian hill tribesman from becoming Wimbledon champion – even though that is exactly what happened. 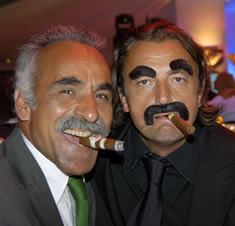 But Bahrami is not just an entertainer, not only a lightweight juggler who makes the fans smile – he is the greatest Wimbledon champion we never applauded. Sometime playing partner, Ilie Nastase, called him “a maestro”. John McEnroe reckons he’s “a genius”. While Rod Laver believes him to be the most naturally gifted player ever to pick up a racquet. Since he didn’t own a real tennis racquet until he was thirteen – he taught himself to play using a rusty old metal frying pan, and other implements – he is indisputably the greatest player ever to wield a kitchen utensil. But Bahrami was barred from achieving tennis greatness because the then rulers of Iran viewed tennis as a decadent Western activity definitely not to be encouraged. 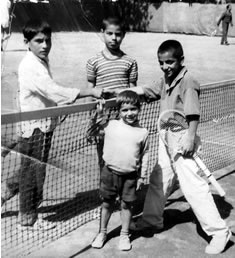 Bahrami was thirteen when the Shah’s friends on the Iranian Tennis Federation recognised they had a teenage prodigy in their midst and, for quite a few years, he was finally allowed to play tennis and compete. In 1975, Mansour made his Davis Cup debut against Britain’s Roger Taylor and lost 6-0, 6-0, 6-2. Being a quick learner, however, he won nine out of his next eleven singles matches, which was incredibly impressive. The cost of living in France was so much higher than in Iran that Bahrami soon realised that what he had brought with him wasn’t going to last very long, so he reckoned he’d better try and do something about it. Unfortunately, he gambled in a casino on his first night and lost! Having lost three years of his career because of the fundamentalist regime in Iran, Mansour then spent the next six years as a virtual prisoner in France because he refused to become a political refugee. “When my French visa eventually ran out, I became an illegal immigrant. Every time I saw a policeman coming, I changed direction. If they had asked me for my papers or ID they would have put me on the first plane back to Iran.” His status also of course made working and earning money even more difficult. In 1981, at the age of twenty-four, Bahrami reached the third round of the French Open as a qualifier, whereupon his cause was taken up by influential French newspapers such as L’Equipe and Le Figaro, who demanded the renewal of his visa. 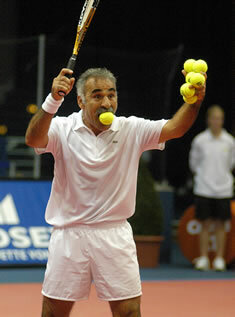 Mansour was thirty years old before he was allowed finally to join the ATP as a full-time professional player. I lost nine years of my life. All my best results (fifteen finals and five tournament victories) came after the age of thirty. I was thirty-three when I reached the French Open doubles final. Am I angry? No, I’m not angry, I feel I am a very lucky man. Whenever you get the chance, go and watch Mansour Bahrami in action: laugh out loud at his antics and toast the greatest Wimbledon Champion who never was.